Embracing smart growth design principles as a blueprint for its future. Less than 10 years ago, the Township of Eastampton, Burlington County was well positioned to be the next poster child for sprawl in New Jersey. More than 40 percent of the residential growth in the township had occurred in the past 15 years alone. The rapid development in the Township threatened its 5.86 scenic square miles of farmland, wetlands, forest and a major branch of the Rancocas Creek. Fortunately, the Township Council came to recognize that these trends were not a recipe for a prosperous future. The community’s sustainability would hinge on a combination of efforts: successful open space and farmland preservation; business development that contributes to a better quality of life; and more investment in neighborhoods and parks to foster a greater sense of community. Through sound, long-range planning the Township is now combating past trends. To date, the community’s open space plan has been fully accomplished, historic buildings preserved, design standards adopted and implemented, and a new mixed-use village center project is underway. Perhaps one of Eastampton’s most bold initiatives was the its aggressive open space and farmland preservation program. In 1999, residents authorized an open space tax of 23 cents per $100 assessed, the highest open space tax in the state, if not the nation. Within a period of four years, the amount of permanently preserved land moved from eight percent of the Township’s land area to approximately 30 percent, or nearly 1400 acres. The township successfully managed to envelope its developed core with farms, reclaimed wetlands and passive and active open space. These protected lands have encouraged positive investment in the core and have strengthened property values, particularly in its older neighborhoods. In addition to saving its open lands, the Township is also took control of the growth side of its smart growth efforts. The community identified the lack of commercial ratables and over-reliance on single-family residences to fund government as a disadvantage. Its commercial base was found to be one of the weakest in the county with only five percent of tax revenue being generated from non-residential properties. It was clear that commercial development was needed, but the community did not have a clear vision. In 2003, the Township looked to the residents for their guidance as to how Eastampton should grow. Using a portion of a $60,000 Smart Futures grant from the Department of Community Affairs, a series of workshops were organized to focus the community’s attention on updating the antiquated commercial district and creating concepts for an adjacent 35-acre parcel owned by the Township. Nearly 200 residents contributed a total of 600 hours of input on the character and extent of future development in the Township. Overwhelmingly, the residents expressed their preference for a classic mixed-use village center. Preliminary analysis indicates that stable taxes, employment, and cultural/recreational opportunities are important priorities. Also important was diversified housing to support commercial growth, particularly for returning college graduates, young professionals and older residents wishing to stay in the community. Finally, being able to walk and bike safely to a village center characterized by well-designed human scale buildings and public spaces was determined to be a highly desirable community goal. The input from the public forms the basis of the newly adopted concept plan for the Village Center District. The plan, drafted by A. Nelessen Associates, is a blueprint for a vibrant, mixed-use community center that puts emphasis on a positive pedestrian experience and seeks to connect the Township’s open spaces with the rest of the community. 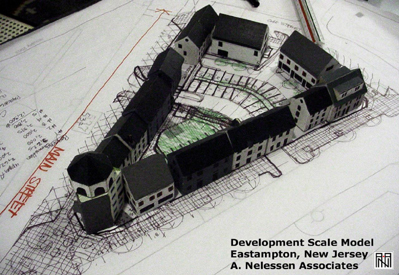 Eastampton has proven that good community design can be scaled for any project. The restoration of the abandoned historic Manor House for use as the Township’s municipal building was the first in a long line of decisions made that reinforce this principle. The 200-year-old building, located in the center of a conventional residential subdivision was transformed into a neighborhood anchor and a focal point for celebrations, a learning center for nearby students, and a place for the community to gather. It is linked via pedestrian paths to the local elementary school and other area parks. Another small project that illustrates this principle is a pocket park improvement project in the heart of the Village Center District. Referencing available urban design materials, the township repositioned the playground and benches in Hollyville Park to form a small green around the tennis court. The result of this simple strategy is a safer, more inviting and better utilized public space. 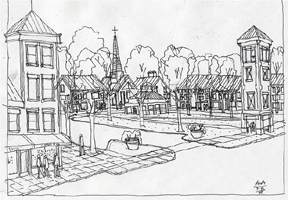 Eastampton also developed basic street design principles to guide new development within the Township. In 2002, Pennrose Properties was the first developer to utilize the new guidelines as part of its 100-unit residential development in the Village Center. Through this development, the Township met its affordable housing requirement and at the same time achieved a pedestrian-friendly environment. The new housing complex features a five-foot wide parkway with street trees placed between the sidewalk and road. The project is built compactly, which allows for more efficient use of land as well as enhanced personal interactions between neighbors. Be it through open space and farmland preservation, economic development, or civic design initiatives, the Township of Eastampton is consistent in its pursuit of a smart growth. With the promise of new, mixed-use development in the Village Center it looks as if continued great achievements are still ahead of them.